PT Reska Multi Usaha - RMU or known as RESKA is a reputable company in Indonesia, running business in train-based services. RESKA has core business competencies in restoration, service on train (SOT), catering, parking, cleaning service, as well as general trading. PT Reska Multi Usaha is a directly-owned subsidiary company of state-owned railways operator PT Kereta Api Indonesia (Persero) or KAI Group. At present, PT Reska Multi Usaha is 95.01% owned by PT Kereta Api Indonesia (Persero). The remainder of the shares belonging to Pusaka Foundation. Headquartered in Jakarta, RESKA now has 6 area offices spread in all over Indonesia ; Jakarta, Bandung, Semarang, Yogyakarta, Surabaya and Palembang. 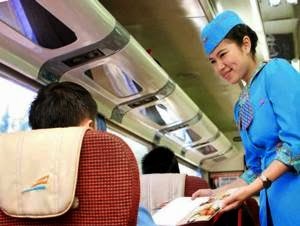 As of December 2016, RESKA served 80 trains with 123 Restaurant Trains (KM), 10 land kitchens in 6 area and managed parking location at 114 stations. According to information found in PT Kereta Api Indonesia (Persero) Annual Report 2016 as quoted by JobsCDC.com, RESKA succeeded in posting excellent financial performance in 2016. PT Reska Multi Usaha registered total revenue in 2016 of Rp387.68 billion in 2018. This number is up 16.7% year-on-year (YOY) as compared with Rp332.30 billion in 2015. Total gross profit increased by 13.6% from Rp87.44 billion in 2015 to Rp99.32 billion in 2016. Age 18 to 25 years old. Computer literate, minimum MS Word and MS Excel (ADM_CN). Never been sentenced / jailed. Polite and customer services oriented. Preferably domiciled in Cirebon, Tegal and Jatibarang. JobsCDC.com now available on android device. Download now on Google Play here. Please be aware of recruitment fraud. The entire stage of this selection process is free of charge. 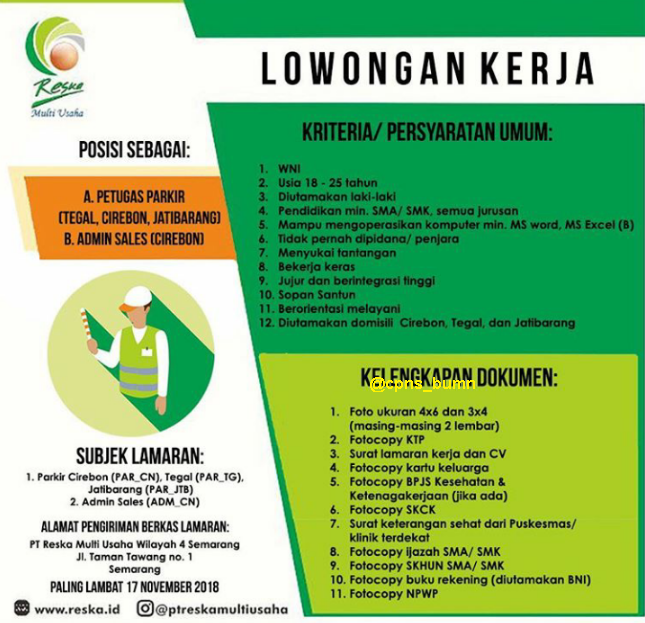 PT Reska Multi Usaha - SMA, SMK Parking Attendant, Admin RESKA KAI Group November 2018 will never ask for fees or upfront payments for any purposes during the recruitment process such as transportation and accommodation.